I have a Libec remote conrol for my EX3. This connects however to the lens, not to the camera. I often use nikon still lenses for nature filming. In that case I cannot use the Libec for start/stop. There is a connection on the back of the camera itself, but I believe that is only for the USD 2000+ remote device RM-B150 or the USD 4600+, so very expensive, RM-B750. Which are not handy anyway for my way of operating in the field. What I need is just a cheap remote cable for the camera with only a start/stop button. Does anyone know a solution? My EX3 came with a small infra red remote (RM-F300). I've never used it (just taken it out of my camera bag to look at it and it still has the plastic tab preventing battery power that it was supplied with) and I have no idea where the sensor is on the cam - hopefully not on the lens part for your needs! Did your EX3 not come with this item? Have a go with the remote Andy, and see if you can get it to work. I have tried several times to use this on a shoot, but to no avail - sometimes it does work but never when a client is present. I know you have to turn it on via the menu and it resets itself when you turn the camera off. In short not an ideal or well thought out accessory. The IR sensor is on the front of the microphone. I have found the distance between the remote and the camera to be fairly critical and perversely closer is not always better. If you want to operate the camera from behind you will probably need some sort of reflector to redirect the IR signal onto the sensor. A reflector can readily be made out of aluminium foil or sheet. An alternative is to use an IR extender. This is a device that picks up the IR signal from the remote and transmits it from an IR emitting diode positioned to illuminate the camera's sensor. If you plan to use the IR remote a lot it makes sense to turn it on using an assignable button which saves you diving into the menu every time you want to use it. Do you really need a remote? It sounds like you're standing close enough to the camera to still be using the viewfinder and operating the lens. I programmed Assign button #1 on all my EX cameras as a record button. It's very easy to find with my left hand without ever looking down or breaking eye contact with the viewfinder. It doesn't take long until you're not even thinking about it when you use it. Works for me. Since I work a lot with long tele lenses I need a remote. Touching the camera, even very carefully, often produces shaken images. The IR remote is really useless. If you can't even touch the camera to press a tiny little button with your finger tip, I'd say you need a better tripod. How to you change the iris, rack focus, or pan if the subject moves? Does the wind have to be dead calm? When I'm shooting (even with a 300mm on my EX3) I need to be able to do all those things instantly -- without destroying the shot. Sounds like you're probably using longer lenses than I am, but still, you really need to have a tripod that is suited for the task. 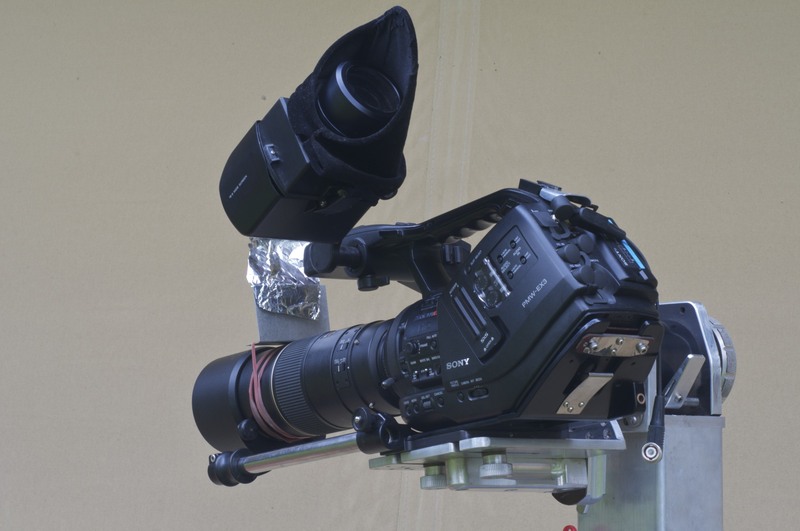 I use a Arrow 25 Miller tripod combination with a payload capacity of 14Kg. I truly believe this is considered to be good quality tripod and in my opinion it has the right balance between stabilty and flexibilty in the field and on my journeys. Indeed, changing iris etc. also produces movement. Panning on the other hand goes very well. For as long as you are steadily moving the camera, there is no shaking at all. All in all I am very happy with this combination. Yes, strong winds are killing. As is touching the camera. I use 300mm a lot, but often also 400mm and sometimes an additional 1.4 extender, which makes it 560mm. Images can be stunning, but you have to be very, very careful. I use a nanoflash and a remote cord to the nanoflash. Both devices very much improve the quality of my work, the remote because I do not have to touch the camera on certain situations. I tend to shoot for example kingfishers a lot and sometimes focus on forehand on a pole where I know it will land. When it arrives, pushing the remote button is all I have to do. 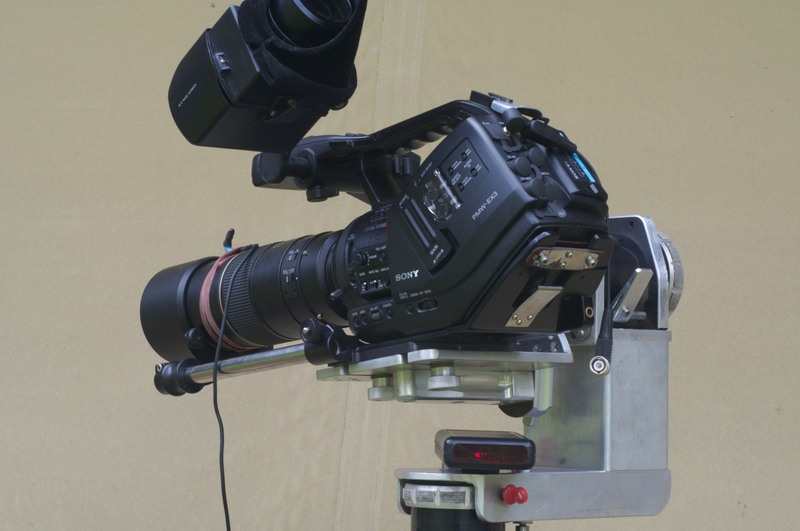 But with the nano you have to chose between either the remote cord as trigger, or the camera (Timecode). So switching from one trigger to another is not possible, without resetting the nano. I want to solve this by using a remote cord on the camera, so I can leave the Trigger option in the nano on Timecode (do you still follow me?). So all I need is a remote cord with only a start/stop button that connects to the camera. There should be something like that for sale somewhere, isn't it? Okay, now I have better understanding of your situation and it all makes perfect sense to me. In fact, I was going to suggest a Nano but I thought it didn't make sense to suggest spending that kind of money just to get a remote control. I also have a remote for my Nano, but it you want to record to the SxS cards and the Nano at the same time, then I agree, that the remote can't help with that. So, getting back to your original question, no I don't have any suggestions for a remote control for the camera when the stock lens is not attached. Thanks for your reply Doug. Hope someone knows the answer. I have provided three pictures to complement my post above. The first shows how crude an IR reflector can be. In this case the piece of aluminium angle is straight from my scrap bin. 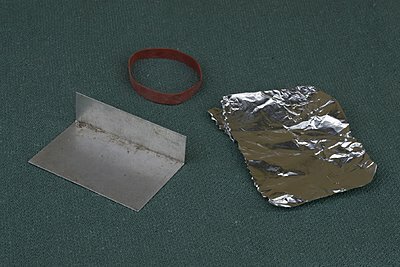 The foil provides more reflection than the angle and the rubber band holds it all in place as shown in the second picture. The third picture shows an Infrared extender that is housed in the black box below the camera. The IR emitter is held in place on top of the lens by the rubber band and its output is directed towards the IR sensor on the front of the microphone. The emitter is connected by a cable to the black box. In use the supplied remote is directed towards the red window on the extender housing. The extender provides greater range and a better choice of positions for the operator than does the reflector option. Although the Sony remote buttons could have been laid out better I find that I can operate either of the required combinations with the one thumb., i.e. two hands are not required. I have the same problem. I solved it by taking my XDR recorder or Panasonic AJ-HPG20 recorder into the hide and leave the camera on the remote head. I can see the problem if you want the kingfisher and probably want to overcrank the camera but I record at 1280x720 50P and its almost as good as 60P.